I read this article and found it very interesting, thought it might be something for you. The article is called Barfly: Darkey Kelly’s and is located at https://www.totallydublin.ie/food-drink/bars/barfly-darkey-kellys/. 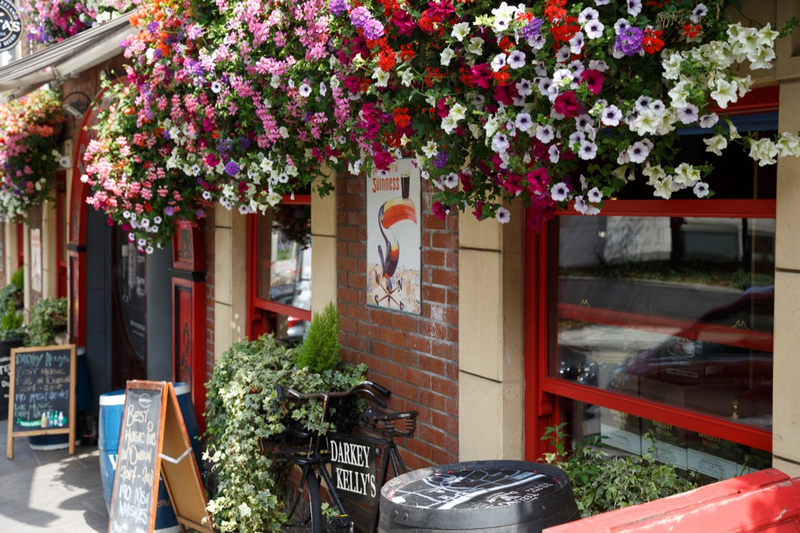 Nestled between Christchurch and Temple Bar proper, Darkey Kelly’s positions itself as the ideal destination for holidaymakers looking to sample the traditional Dublin pub experience – pint of d’black schtuff, dish of coddle, buy a postcard for the gang back home – the whole nine yards. In the tourist-centric “Irish Pub” game, a healthy veneer of authenticity goes a long way. 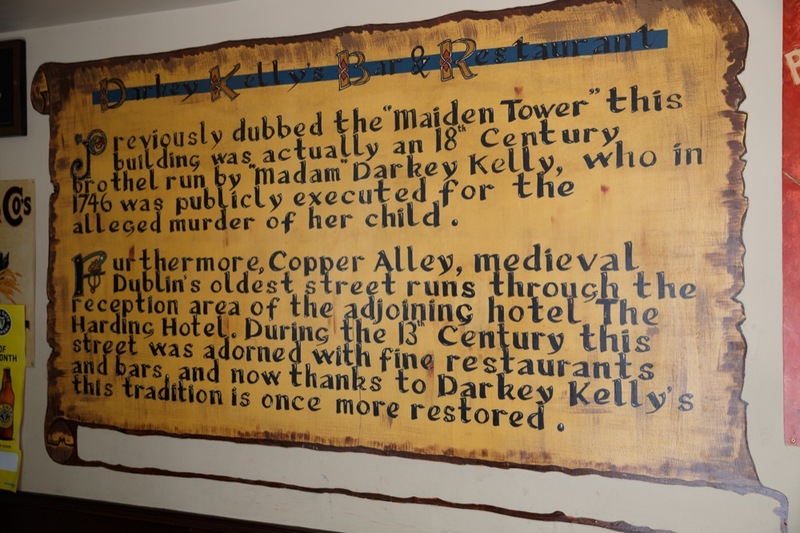 Darkey Kelly’s is in pretty good shape on the c’mere-to-me-and-g’way auld-Dublin front; not only do they proudly advertise their position of “Best Music Pub 2017-2018” but they’ve even got a little local history that they can roll out as demand dictates. Emblazoned on the wall of their foyer, a mural rendered in the style of tattered scroll recounts the tale of the woman that furnished the establishment with its name. The Madame of the brothel that once operated near the pub, Darkey Kelly’s name has been uttered in hushed tones since the 1700s. Believed to be a witch, Kelly was burned alive in 1746 for the alleged murder of her own child, amongst a laundry list of other spooky activities. The story goes that the wishes of the then Lord Sheriff were the principal motivation for Kelly’s execution, as he had fathered the child in secret. The sheriff contested that Kelly had attempted to extort money out of him by placing him under a spell – in reality, many believe that Kelly threatened to expose the sheriff as a member of the infamous Hellfire Club (God be with the days of the city’s occult boom). The only real hints towards the realities of the case can be gleaned from Darkey’s remains. Whatever happened, the execution seems to have been performed in haste, with Darkey having been hanged before she was burned. Grim, eh? Though, in fairness, the discovery of five men’s bodies in the vaults below the brothel suggest that Kelly might not been a madame with a heart of gold in the mould of The Best Little Whorehouse in Texas. So, witchcraft, immolation and infanticide aside, what does Darkey’s namesake have to offer for the discerning pintist? Little by way of surprises anyway. 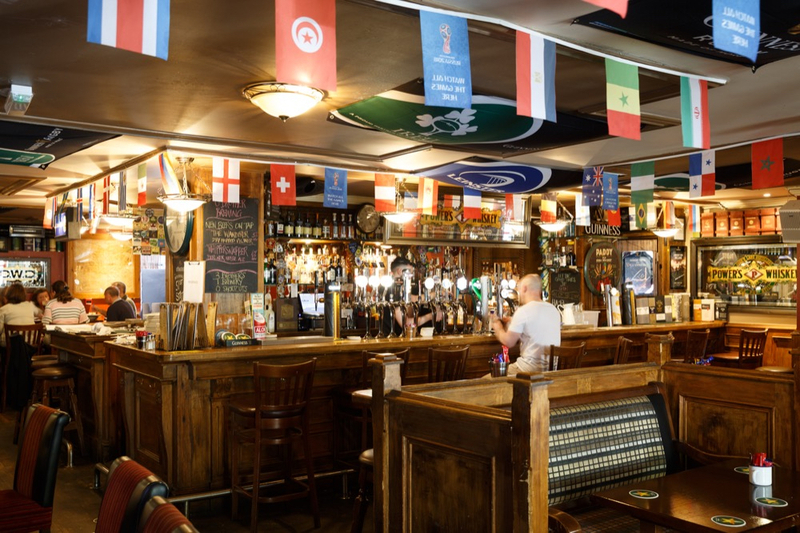 Low-ceilinged, wood-panelled and lined by televisions, the look of Kelly’s interior is nondescriptly Oirish, lending it more the feeling of an “Irish Pub” as opposed to a pub that is actually in Ireland. Maybe it’s unkind to critique Darkey’s for playing to their chosen audience; on my arrival, at 5pm on a Thursday, most seats were already occupied by large groups, with the numbers of principally spanglophone clientele in situ quickly betraying the establishment’s primary role as a walking tour terminus. As I drain my final drink and shuffle toward the door, the trad trio on stage engage in some audience participation to a rapturous reception, and who am I to judge?